This year Stephen maxed our garden spot to capacity. 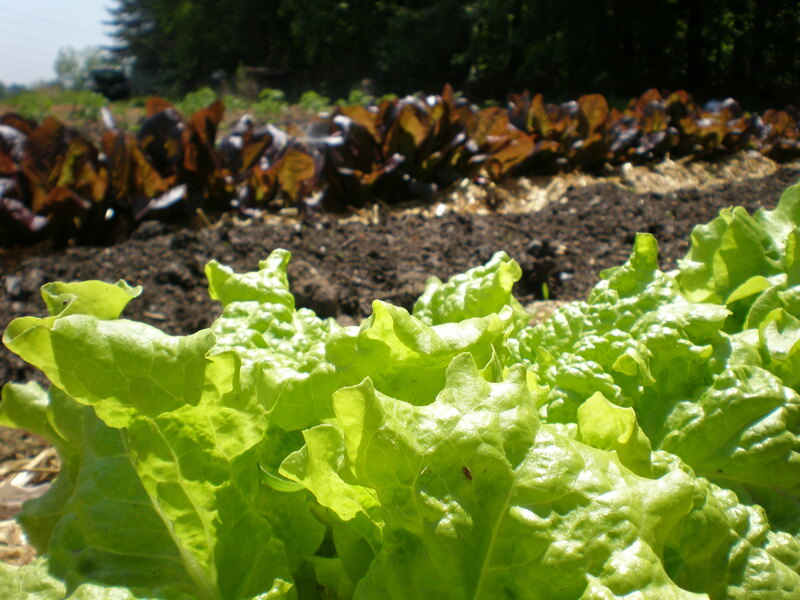 For weeks we were loaded down with lettuce, carrots, butter peas, brown peas that I don’t have a name for, green beans, tomatoes, and peppers – and this year we wanted to try and save some of our favorites items to use throughout the fall and winter. There were some successes and failures….we’ll start with the successes because the failure story is a little rank. All form of beans were nicely blanched, bagged, frozen, or dried. They are all safely stored in the pantry or freezer. 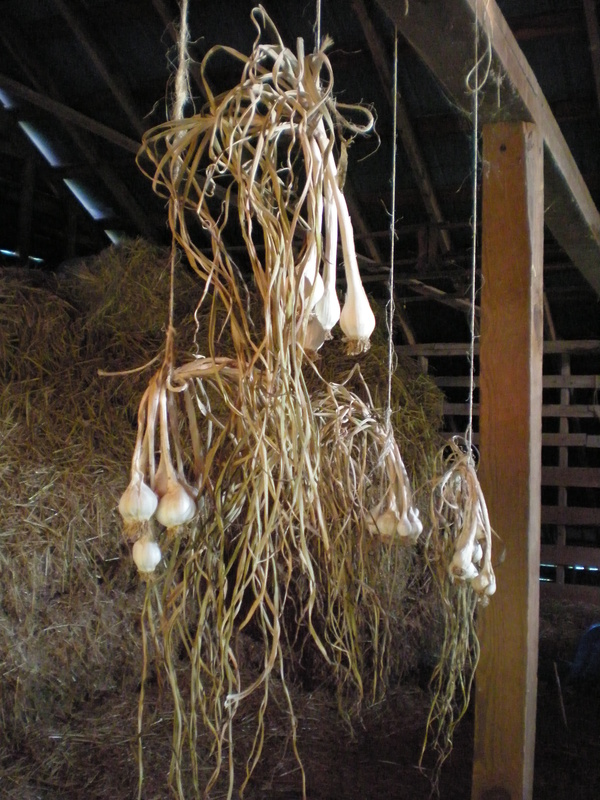 Onions and garlic were harvested, dried, and hung in the barn loft. Now that most of the hay is gone, it is pretty easy to get up there and move about. And then, there were the carrots. Our carrot crop didn’t do very well this year, but we still had a good plenty to store up. We had heard once that you were supposed to store carrots pretty much the same way that you store potatoes – and I still have no idea how true that is. Most people around here just store potatoes under the house. Well, to successfully get under our house you need to be about the size of a small child…and since I wasn’t too confident that my cousin would jump at the chance of volunteering her three year old for the job…we decided that another solution needed to be found. Stephen and I thought about it for awhile, and figured we’d try using an extra styrofoam cooler. After all, coolers are dark, dry, and are easily sealed up. Looking back, I think it was the easily sealed up part that got us in to trouble. A few weeks later I’m in the kitchen fixing supper and I smell this horrible stink – and I mean unbelievably horrible. Then I notice this toxic brown slime dripping to the floor – where the heck is this coming from! Carrots can not be stored in a cooler. They will rot and mold beyond belief – colors and stink that you did not know existed! The toxicity of the slime will be great enough to rot through a styrofoam cooler. I thought styrofoam could not be biodegraded! Stephen was heartbroken. 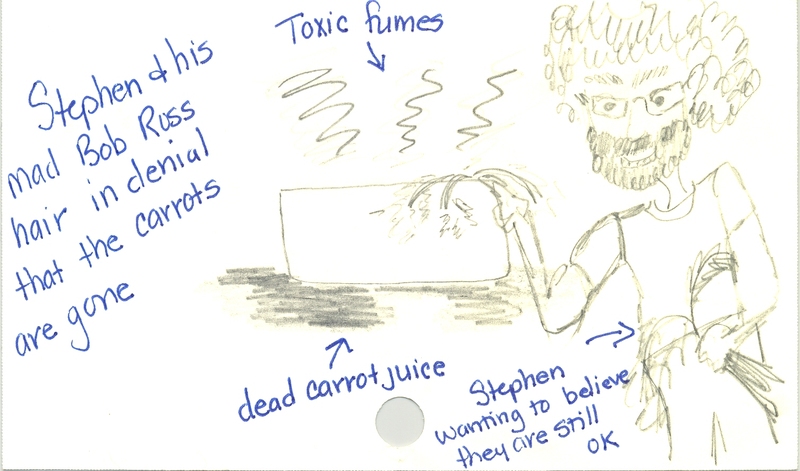 I promptly sent him outside to get rid of the carrots; he was still speaking out in denial between dry heaves and gagging at the deadly stench radiating from that box. So friends, what have we learned about food storage and life in Pleasant Hill in today’s post? Carrots cannot be successfully stored in styrofoam coolers, just stick to the under your house method or preferably whatever a legitimate carrot farmer suggests. Stephen’s hair really is like mad Bob Ross hair when it hasn’t been cut in several months….and yes his eyebrows are just as big. We may have discovered a solution to the problem of non biodegrading styrofoam in our nation’s landfills – just seal it all up with some fresh carrots and let nature do it’s thing….if you can handle the eye watering odors that it will emit. 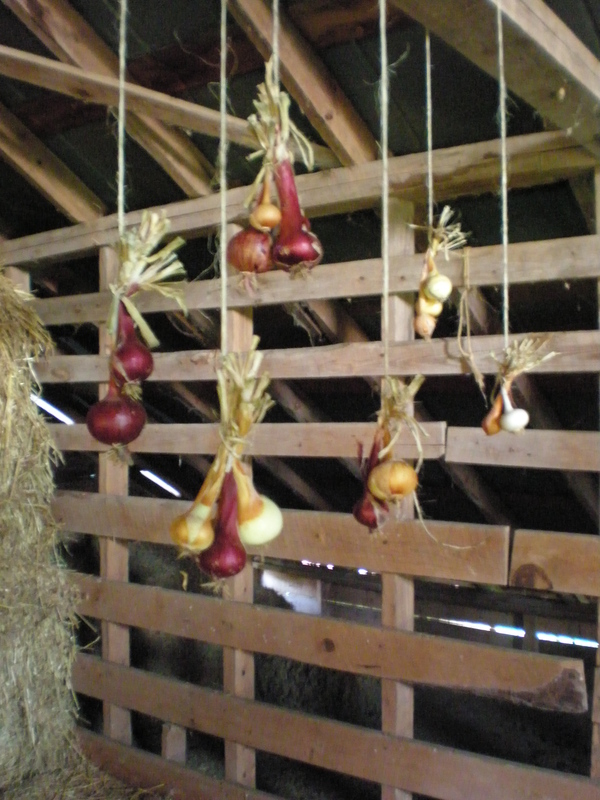 Onions and Garlic in the barn are really nice…plus you feel all old timey when you go cut one down to cook with. Good idea Stephen!